To order wheat berries through our local co-op, click here to see our current order forms. Or have your order shipped here. If you’d like us to notify you when we take orders for wheat, sign up for our emails. What is Prairie Gold Hard White Wheat Good For? Hard white wheat is by far our most popular wheat. It’s lighter in color than traditional red wheat and produces a very light, mild-flavored bread. The nutrient content of hard white and hard red wheat is nearly identical. Hard white wheat is high in gluten, a protein that stretches to trap the air bubbles given off by yeast within the bread dough, so it is best suited for making yeast-leavened or sourdough breads. 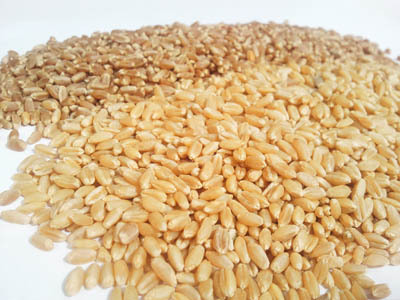 Our Prairie Gold Hard White Wheat is available in 50 pound bags, 25 pound bags, 5 pound bags, and 45 pound sealed pails. Last spring, our daughter did an experiment comparing three different types of wheat. In her experiment, bread made with Bronze Chief hard red spring wheat rose nice and high and stayed soft for several days. Here is a photo we took of breads she made with Prairie Gold hard white wheat, spelt, and Bronze Chief hard red spring wheat. Watch Emma’s bread experiment video here. To receive a message when we take orders for wheat, sign up for our emails. Cost on 5 50 lbs bags of hard white wheat shipped to SC? I would like to see prices and weight please. I am looking for a grain and spice supply house that will sell to the public in bulk. ie… 25-50 lb grain. Barley, wheat, etc. Do you have a catalog avail? Pricing? If your company is wholesale only could you recommend a supplier? We do sell grain in bulk amounts both to the public and wholesale. Our catalog is our order form, which you can find here if you’d be picking up in Tennessee or some of the neighboring states. We can also ship bulk orders, and you’d find the prices and products here. All prices include shipping at this point, but that will change within the next several months. I’m trying to find out how pure is the prairie gold wheat. Has it ever been genetically modified? No, it has not been genetically modified. Can you e mail me the price of the prairie gold pail and the shipping amount so I can order. We are currently out of stock on the Prairie Gold wheat, but when it is back in, the price is posted on the order form here. All of our products ship for free at this time. Sure! Actually, our pick up locations change often, and because of this, they are only visible when a catalog is open. We will be opening our next delivery cycle within the next few days, and then the pick up locations will be visible. This link will not work today, but once the catalog is open, you’ll find it here: https://bnf.go2orderform.com/.